8 islamic militants shot people and blew themselves up causing hundreds of wounded and 127 deads. At pubs, a theatre and at a stadium. Another black day within months after the Hebdo attack. My thoughts are with the family and loved ones of the victims. 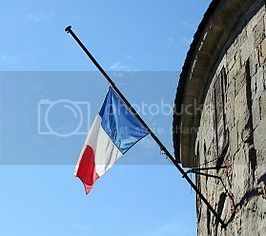 14 july, Frances holiday and national day of the Bastille marked the day of a huge tragedy. A man later identified as a 32 year old Tunesian originated Frenchman, used a truck as a weapon to kill and injure many people. With his truck he drove through a barricade hitting people who just watched the fireworks. Many victims under the children from the childrens hospital located at the opposite side of the street who were watching the fireworks. The man was able to drive unmolested for 2 km's. During his ride he killed 84 people and hurt over 200, many seriously. Finally policemen shot him dead. The terrorist had a history of violence and was recently divorced of his wife. Inside the truck police found fake weapons. IS claimed responsibility for the attack however, there are no connections found. Another sad day for France and Nice in particular. Our thoughts are with the victims and there loved ones! Today a 46 year old woman and her 3 daughters were attacked by a 37 year old moslim. The woman and two of here daughters were seriously injured and flown to hospital by a helicopter. All were staying in a holidaypark at Laragne in the France Alpes. The perp fled after his cowardly act but was caught by alarmed police very fast. According to him the 4 were to "naked" by the extrememist islamic standards of the terrorist. Do we have a problem, yes. Unfortunately the government doesnt see it the way we do on the street. 29-year old Frenchman of Tunisian descent rammed over a civilian and a guard in an entrance of a mosque in Valence, Drôme, reportedly while chanting Allahu Akbar (Allah is the greatest). He then put his car into reverse to try to ram the soldiers again who fired warning shots and then fired to disable the driver. The driver said he wanted to kill troops because "troops killed people" and that he wanted to be killed by the troops. On 7 January 2016 in Paris, a man wearing a fake explosive belt attacked police officers with a meat cleaver while shouting "Allahu Akbar!" He was shot and killed by officers when he failed to obey an order to stop. The attempted attack took place on the one-year anniversary of the 2015 Hebdo shootings. The failed attack occurred in the Goutte d'Or district where the population is predominantly of north African and sub-Saharan African origin. The perp named Belgacem shouted "Allahu Akbar" and pulled out a meat cleaver as he approached a guard at the local police station. He was shot and killed when he ignored orders to halt. His pocket contained a written rambling statement that included a drawing of an ISIS flag, and his pledge of allegiance to the caliphate. Tarek Belgacem was identified by police in North Rhine-Westphalia as the attacker. He was a Tunisian immigrant who moved to Europe via Romania in 2011. Initially, it was known that Belgacem had used at least seven aliases. It was later determined that he had a total of 20 identities in seven different countries. He had been posing as an asylum-seeker from Iraq or Syria, and was living in a center for asylum-seekers in Recklinghausen, Germany, since August 2015. By 11 January, it was reported the suspect had surfaced in Germany in 2013 after living in France for five years. Police found an Arabic banner reading "Islamic State forever" on the wall of a communal kitchen in the center. At the site of the attack, Paris police officers found "a piece of paper on the man's body with the Muslim profession of faith, a drawing of the Islamic State of Iraq and the Levant (ISIL) flag and a pledge of allegiance to the extremist group's leader, Abu Bakr al-Baghdadi". The suspect was also carrying a cellphone with a German SIM card. A 15-year old Turkish boy attempted to decapitate a teacher from a Jewish school in Marseilles with a machete. A man shouting "Islamist slogans" stabbed his neighbor, a 42-year-old police officer, to death before taking the officer's wife and son hostage. Police raided the house and killed the attacker and discovered the officer's wife dead but his son alive. ISIS claimed responsibitiy. A Priest, (Father Jacques Hamel, believed to be 86) has been cowardly beheaded and another hostage is ‘fighting for his/her life’ after two knife-wielding terrorists took two nuns and several worshippers hostage at a church in northern France. On of the nuns managed to escape and warned police. Quickley after arrival a special police unit killed two bearded men responsible for the hostage. A third suspect has reportedly been arrested outside the church. Local media claims Father Jacques Hamel, believed to be 86-years-old, was the priest slaughtered by the duo as A’maq news agency, which is connected to ISIS, has officially reported that “two soldiers of the Islamic State” carried out the savage attack. Again a cowardly attack against, when will our politicians wake up to see the danger they brought to us? Today in paris in a mall near the Louvre museum a terrorist attacked French soldiers on patrol with 2 machettes. He shouted Allah Akbar according to wittnesses. The attacker lightly injuried one of the soldiers before getting shot and hit 5 times by another soldier. He was badly injured and transported to a hospital. The man carried a bag with him, but no explosives were found, in his house no weapons or explosives were found either. The man is a 29 year old Egyptian, he came from Dubai using a tourist visum. Another man was arrested at the scene because police found he acted suspicious. Nothing is known about the mans identity or his motives. Two soldiers patrolling Orly airport in Paris have shot a man dead after he tackled their female colleague to the floor and tried to take her weapon, according to French Defence Minister Jean-Yves Le Drian. He tackled the woman and was able to grabb her gun, he used her as a shield. When he rose up a little the other soldiers got a chance to shoot him. The man, a known criminal named Zyian Belgacem, had earlier in the day opened fire on a police officer during an identity check in the northern Paris suburb of Garges-les-Gonesse, according to Interior Minister Bruno Le Roux. He was stopped by an officer for traffic violations. At some point he unarmed the policeman and shot him. The officer was only slightly injured. Then, Paris police said, he stole a woman's car at gunpoint. It was found near Orly. Police did not immediately provide a motive or identify the attacker, though the Paris prosecutor's office said he was 39 and had a record of robbery and drug offenses. The office said he did not appear in a French government database of people considered potential threats to national security. The prosecutor's office said its anti-terrorism division was handling the investigation and had taken the attacker's father and brother into custody for questioning. Francois Hollande, the French president, praised the courage and efficiency of troops and police following Saturday's incidents. In a written statement, Hollande reaffirmed the state's "determination to act without respite to fight terrorism, defend our compatriots' security and ensure the protection of the territory". Police reported they have arrested two IS symphatisants today. The men who have been arrested are aged 23 and 29, the police was on the lookout for the men. One of them had been in prison before and radicalised in prison. Secretary Fekl said the men had plans to attack high priority targets during the upcoming French elections this weekend. After searching the suspects houses police found weapons and materiel to make explosives. A man stopped his vehicle next to a police van and opened fire with an AK killing 1 and wounding two officers and a tourist. He was shot dead by a fourth officer. Police started a manhunt to find another suspect but this man proved to be innocent. The killer, named Karim Cheufri, had a message from IS. He was a known criminal and was allready convicted twice for attempting to kill police officers. Allthough he was radicalized police had no knowlegde of that fact. Investigations are launched to find out why the man wasnt on the terrorist list in France. At the Champs-Élysées in Paris car crashed into a policevan. The van was the first car in a convoy of cars from the police. The car immediately caught fire, the officers in the van were just lightly injured. The driver of the car died ( again a known radicalised man aged 33). Its not known if he was shot or if he died from the wounds caused during the accident. French media reported soldiers on the scene immediately secured the area. In the car weapons and gas containers have been found. In the area all bus and subway traffic was halted. The area itself was blocked by the police after the incident. French prosecutors launched a terrorism investigation after a man wielding a knife and shouting the Arabic phrase "Allahu Akbar" (God is great), tried to force his way in to the Eiffel Tower in Paris on Saturday night, a judicial source said. The incident at the world-famous tourist landmark was designated a terrorism case because of the suspect's statements to police, in which he said he wanted to attack a soldier, and his apparent radicalization, the source said. No one was injured in the incident that occurred around 11.30 p.m. (2130 GMT) on Saturday shortly before closing time, Eiffel Tower operator SETE said in a statement on Sunday. The man, brandishing a knife, tried to force his way through a security check before being stopped, it said. Police evacuated the tower to carry out a check of the entire site. A source close to the investigation said the suspect, a French national born in Mauritania in 1998, had been in a psychiatric hospital for several months and was granted permission to leave care from Aug. 4 to Aug. 6. During police questioning, the man said he had wanted to carry out an attack against a soldier and had been in contact with a member of Islamic State who had encouraged him to act, the source said. The suspect was convicted last December for defending acts of terrorism and for making death threats, the source said. He was given a four-month suspended sentence. France has been under state of emergency legislation since November 2015 Islamist attacks in which 130 people were killed in and around Paris. Its interior minister said in a newspaper interview published on Sunday that the threat of militant attacks was "very high". After pushing his way past a security guard at the entrance to the Eiffel Tower, the man approached soldiers patrolling at the site and, holding a blade, shouted 'Allahu Akbar', the source said. But he complied when the soldiers told him to put down his weapon and offered no resistance when arrested, the source added. Security forces have been targeted in several incidents this year, including two on the Champs-Elysees avenue and one outside Notre Dame Cathedral, also renowned tourist sites. Militant attacks in France led to a drop in visitor numbers last year but activity has recovered in 2017. French police hunting a driver who rammed a car into a group of soldiers in Paris early Wednesday morning have shot, wounded and arrested a man on a highway north of the city. A Lille policeman was injured by stray gunfire during the arrest. The man, who was unarmed and hit with five bullets while attempting to evade police on the A16 motorway, is in a serious condition. He was arrested between Boulogne-sur-Mer and Calais. The suspect, born in 1980, reportedly drove his vehicle into a police car before being arrested. Prime Minister Edouard Philippe confirmed that the person arrested is the same man who carried out the attack. France's counter-terror unit is investigating the attack, in a suburb of northwest Paris, which left six soldiers injured, three seriously, according to Paris police. The soldiers' injuries are not life-threatening. Police had been searching for a BMW car and its driver who rammed into a group of soldiers outside a barracks at the Place de Verdun in Levallois-Perret around 8 a.m. local time. Minister of the Interior Gerard Collomb said the attack was a "deliberate act." "The car accelerated towards the soldiers for five meters in order to hit them," he told reporters. "We do not believe this could be an accident." The mayor of Levallois-Perret, Patrick Balkany, told BFMTV that the car was "pre-positioned" in a small alleyway, waiting for troops from the 35th Infantry Regiment to come out of the building. The group of soldiers is part of France's Operation Sentinel, set up in the aftermath of the Charlie Hebdo terror attack in January 2015. A man carried out an attack with a knife at this station, yelling the infamous but well known Allah Akbar. At least two women are reported to have been killed, aged 17 and 20. The station has been closed. Anti terrorist squadmembers killed the man. It was the second attack in marseille, when a month ago a car slammed into a busstop. There are no reports about his identity other than that he was known to the police. French police made an end to a hostage situation this afternoon, unfortunately 3 of the hostages died in the assault, 16 people were wounded. The hostagetaker, a radical moslim was shot dead. Again a petty criminal aged 26. This took place in a supermarket in Trebes. Before that the terrorist shot a woman in Carcassonne and stole her car. One of the dead is a police officer named Arnaud Beltrame. He offered to volunteerly take the places of a wounded woman. She was released by the terrorist. When at a given moment the terrorist started shooting the police attacked. The terrorist demanded Salah Abdeslam to be released, the man responsible for the terrorist acts in Paris in 2015. Like many who survived Nazi horrors, Mireille Knoll embraced life, eating out and going to the theater despite limited means. Even as age and Parkinson’s disease took their toll, she delighted in receiving guests — until one of them allegedly stabbed the 85-year-old to death because she was Jewish. The brutal killing in Paris last week has raised uncomfortable questions about resurgent anti-Semitism in France. “I thought I was going to die on the spot. I cried all the tears in my body and I thought of her. She didn’t deserve this,” her anguished son, Daniel Knoll, told The Associated Press Tuesday, near the Paris public housing project his mother called home for most of her life. Mireille Knoll was killed Friday in her apartment, which was then set on fire. On Tuesday, prosecutors filed preliminary charges against two people for murder with anti-Semitic motives, including a neighbor Knoll hosted regularly, to lessen her loneliness. View of the apartment door of Mireille Knoll, 85, who was was slain last week, in Paris, France, Tuesday, March 27, 2018. Police seals, hearts and a photo of her are pasted on her entry way. Knoll had been stabbed several times and her apartment set on fire. Two suspects have been given preliminary charges of murder with anti-Semitic motives over the death of an elderly Jewish woman, a French judicial official said Tuesday. As Knoll’s family gathered in Paris to attend her funeral on Wednesday, horrified French leaders and activists called for people to take to the streets to protest racism. For Knoll’s family, the killing was a cruel coda to her long life. At age 9, she fled Paris to escape a notorious World War II roundup of Paris Jews. French police herded some 13,000 people — including more than 4,000 children — into the Vel d’Hiv stadium in 1942 and shipped them to the Auschwitz death camp in Nazi-occupied Poland. Fewer than 100 survived. A family member with Brazilian citizenship helped Knoll and other relatives escape Nazi-occupied territory for southern Europe and then Canada. She returned to France only after the end of the war. Over the years her grandchildren and other French Jews moved to Israel, but Knoll stayed in her beloved Paris, living nearly her whole life in the modest apartment on Avenue Philippe Auguste. Authorities have not released the names of the two men in custody but have said the chief suspect is a 29-year-old with a past conviction who lived in the same building. Daniel Knoll said the suspect had lived there since he was 7. “My mother had a thirst for knowledge and meeting new people and talking to them and that’s what killed her,” he said. On Tuesday, a photo of Knoll hung on her door, surrounded by paper hearts and a police notice saying the apartment was the subject of a judicial inquiry. On a gate outside the building in eastern Paris, neighbors hung up a tribute poster. Candles flickered next to piles of flowers in her honor. Smoke residue from the fire still stained her apartment window. Speaking Tuesday in Herzliya in central Israel, Jessica Knoll stroked a ring her grandmother gave her on her last visit to Paris, and remembered her irrepressible energy. “She used to run faster than us,” she told the AP. Daniel Knoll remembered his mother as talkative and vivacious. In a home video she could be seen raising a glass and declaring, “Lechaim!” — “to life!” in Hebrew. When she could still walk, he said, “she was going to restaurants, to theaters, to cinemas to see movies. She likes so much to read, she likes life so much. All those people who know war, they like life, maybe more than these crazy people” who killed her. Mireille Knoll’s husband was deported to Nazi concentration camps, and their wartime experiences colored their children’s lives. Yet, despite a resurgence of anti-Semitic violence and vandalism in recent years, and anti-Israeli sentiment among many young French Muslims, Daniel Knoll said he didn’t feel targeted for being Jewish. The French Jewish group CRIF compared Knoll’s killing to that of Sarah Halimi, 65, who was beaten and thrown from her balcony last April. That murder was reclassified as anti-Semitic last month. The suspect is in a psychiatric hospital. France’s government presented a plan earlier this month to fight racism and anti-Semitism, focusing on social media and prevention in schools. It also wants to change French law to force internet platforms to detect and remove illegal content. An annual national count of racist, anti-Semitic, anti-Muslim and anti-Christian acts — most involving threats — dipped in 2017 compared with the year before. But anti-Semitic violence increased by 26 percent, and criminal damage to Jewish places of worship and burial by 22 percent. It doesnt end.... another attack in paris. This time caused by a Tjetsjenian aged 20 years aold. Around 21.00 he drew a knife and stabbed at people randomly killing 1 and injuring 4, of whom 2 are in critical condition. Many people hit the ground when police arrived afraid of getting caught in gunfire. A policeofficer tried to take the man down with a taser, after that failed the attacker still wouldnt give up. The police than shot him dead. French president Macron reminded the French people about the good work of the French army against the terrorist threat and defending freedom. "We will not stand down", he said. The attack was claimed by DAESH. Seven people including two British tourists were wounded Sunday in Paris after they were attacked by a man armed with a knife and an iron bar. The attacker was an Afghan national who was arrested. "Nothing at this stage shows signs of a terrorist nature in these assaults," policesources said, adding that the attacker had targeted "strangers in the street." Of the seven wounded, four are in a critical condition. It was not immediately clear if the attacker was among one of the injured. The incident took place just after 11 p.m. local time (2100 GMT) on the banks of a canal in the northeast of the capital. A second attack this day in Paris. A man attacked two people with a pair of scissors, both were injured. Police took him out with a taser and arrested the attacker. There is nothing known about the motives nor about the nationality of the man. French police organized a large manhunt for the man who attacked visitors tuesday the 11th at 22.00 at the x-mas market. A terrorist opened fire on the people visiting the market, killing 3 and wounding 13 of which 5 are in bad condition, of those 5 two have died bringing the number to 5 killed. Among the dead is a man (45) a tourist from Thailand, his wife is among the injured. The shooter ( 29 year Cheriff Chekatt) is still on the run. He is known with the French police and has a large crime history with 20 known confictions including armed robberies. In total there have been 3 incidents, two firefights with policemen and the attack on the market. The terrorist was hit in one of those engagements but somehow managed to escape. In the mean time 100 s of policemen have set up roadblocks and border security has been tightened. There was a search near the kathedrale in Strassbourg. 5 people have been arrested who are known to have ties to the terrorist. All other x-mas markets have more security, police is searching through the city. All other public events like a demonstration are cancelled. The threat level in France is now at the highest level, long live the religion of peace. On the day of the attack the police raided his house searching for evidence on a case of manslaughter. Reports confirmed he was on the terrorist list, together with over 20.000 others. However he still managed to do the terrorist attack.